Well, Allie’s Return will be coming out next month and it’s time to say goodbye to the exclusive extras for Oceania: The Underwater City. So I’ve written one farewell post to Oceania: The Underwater City on my blog. To accompany this little goodbye to the extras on Oceania: The Underwater City, I’ve created a new page on my website called “Extras.” Here you’ll find extras for my novels. 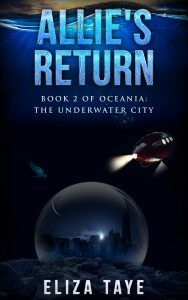 Right now there are FREE downloadable bookmarks for both Oceania: The Underwater City and Allie’s Return. To get your free downloadable bookmarks, click on the link below. There’s yet another blog post exclusively about Oceania: The Underwater City. This time I’m explaining how ocean exploration relates to the story and also sharing a few bits of ocean exploration research with you. Guess what?! Another Oceania: The Underwater City book will be released next month! It’s called Allie’s Return. Check out the teaser synopsis and book cover below. If you wish to read more, head over to the Books page. Two summers have passed since Allie first discovered Oceania. In just those two years, the world has changed but not for the better. Another plague is ravaging the world and Allie is whisked away to Oceania by Dylan for protection. Unable to return to the surface, Allie is forced to find a way to integrate herself into the world of Oceania. Will she be accepted even though she’s once again entered the city illegally? Will she find her place among the Oceanians or will she find the society she once saw as a haven overly restrictive and too much for her to handle?